The solution to protecting important pages is clear - Diamond Clear. Keep documents safe and show them off impressively with Diamond Clear Heavyweight Sheet Protectors. The durable heavyweight material offers sturdy protection for frequent use. The Easy Load feature includes a notched corner and wider top opening to easily slide one sheet into the protector. The solution to protecting important pages is clear - Diamond Clear. 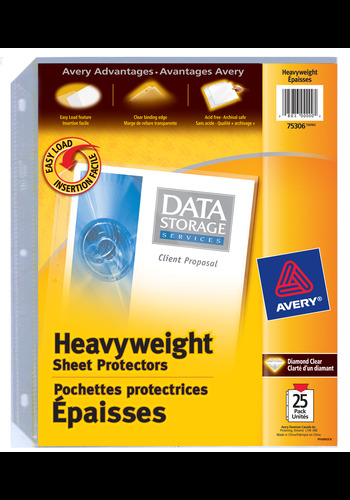 Keep documents safe and show them off impressively with Diamond Clear Heavyweight Sheet Protectors . The durable heavyweight material offers sturdy protection for frequent use. The Diamond Clear finish delivers a crisp view when displaying important documents and the Clear Binding Edge completes the professional finished look. The Easy Load feature includes a notched corner and wider top opening to easily slide one sheet into the protector. Non-stick sheet protectors are PVC-free, acid-free and archival safe material ensures print remains on paper instead of on the protectors, while delivering lasting protection for your important documents. A premium look and finish for sheet protectors. Protect sheets without a distracting white edge to display a professional-quality presentation page. Sheet protectors include the Avery Easy Load feature that consists of a notched corner and a wider top opening on sheet protectors to ensure pages slide quickly and easily into place.